My kids will eat any meat as long as it's roasted or grilled. I was trying something new tonight and it came out delicious!! Preheat oven to 450°. In a small bowl, mix together the oregano, 1 tsp of kosher salt and 1/4 tsp black pepper with a 1/4 cup olive oil. 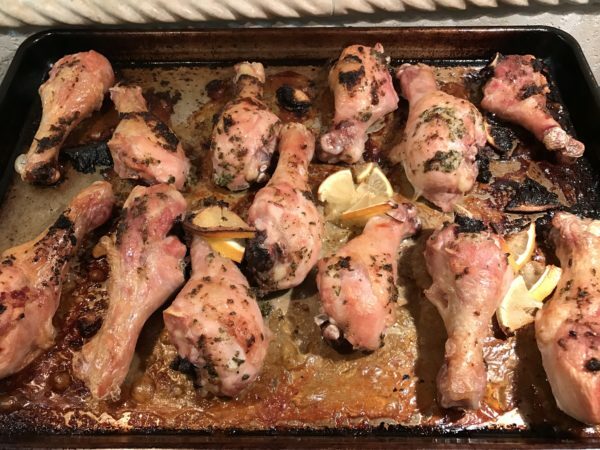 Toss the drumsticks to coat with olive oil mixture. Place the coated chicken on a rimmed baking sheet. Bake for 35 minutes. Serve with roasted potatoes and greens. You could roast the potatoes on the same sheet as the chicken, for about 15 minutes or until golden brown.